(PhysOrg.com) -- If ever you go look outside at all the traffic on the road, it's hard to not come to the conclusion that what’s needed is a smaller vehicle; perhaps one that doesn’t take up any more room than the body that it needs to transport. The Segway is a good example, though it does take up more ground space than a person simply standing. 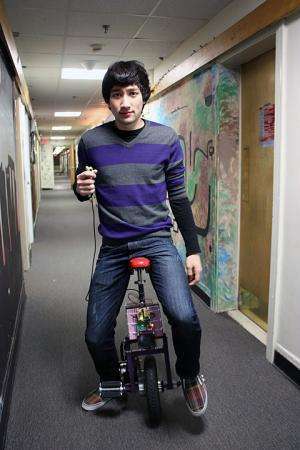 Lucky thing we have smart people like Stephan Boyer, a student at MIT who has created an electric unicycle that not only does some self-stabilizing, but is an actual functioning vehicle which he uses to get himself around the school campus. Boyer calls his creation the Bullet, and in the video he’s made of himself riding it in a dorm hallway, it’s easy to see that not only is his design simple, innovative, and economical, it’s very, very cool. 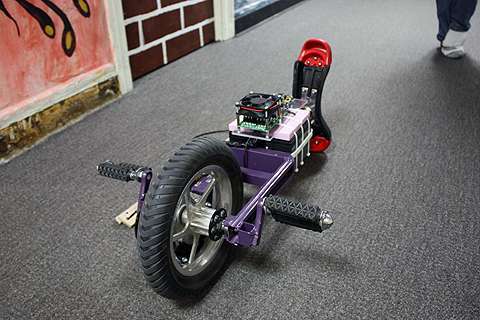 Also, it’s not much bigger than a plain-peddle unicycle, which means he can carry it up stairs, onto busses or perhaps even into the classroom, yet it can zip along at up to 15 miles per hour and go for five miles before needing a recharge. 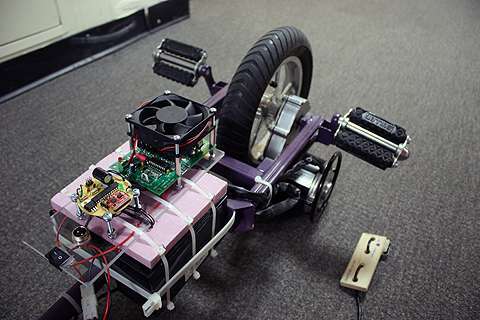 Granted, the Bullet isn’t fully self-balancing, the gyro components inside only help to keep the rider from falling forward or backward, but it would seem that’s enough, as the legs and feet can prevent falling left and right. Also, Boyer notes that there is a bit of a learning curve, just as there would be learning to ride a bike with no hands, which he says is sort of what riding the Bullet is like. But, clearly, these are minor obstacles. What’s important here is that he’s used existing technology, brains, and the education he’s receiving to build a working, functional, electric ultra-small vehicle that could likely be used by millions of people the world over to help reduce traffic congestion, our reliance on fossil fuels, and perhaps to get over the notion that things have to be big and bulky to be truly useful. Boyer says because he used cheaper components in putting the Bullet together, the resulting vehicle cost several hundred dollars less to build than other such vehicles by more established players, which means it’s possible that such a vehicle could be in the price range of many would-be eco-enthusiasts. Not that Boyer has plans to market the Bullet. For now it appears that he is happy about the attention his creation has wrought and pleased that he has been able to build himself a cheap but cool means of transport around a notoriously difficult to impress crowd at one of America’s most prestigious technical institutions. Neato. I like the idea of the handheld pressure-release kill-switch, maybe you could try integrating it into the seat, that way the kill would happen as soon as the rider dismounted, voluntarily or otherwise. Sometimes people tend to clutch what's in their hands in a moment of stress, so having the controls in one's hand might have unintended consequences during a spill. Might want to add in a kickstand of sorts down the road also. Judging by the website, there is still quite a sharp learning curve, understandably for a proto, but I think you are on the right track. A resourceful kid with fun ideas. Crush him, corporate America! Check out the Honda U3X which they demoed last year. I always knew MIT was a party school. Prepare to be sued by Segway. Cool, but how do you steer it? I note in the video he's only going straight down hallways. how fast does it go? I live in china and have a gas powered scooter and i have found that 30kmh is just fine for my needs, but faster is ok too. Personally i am waiting for the synthetic bat wings backpack assembly. up to 15 miles per hour and go for five miles before needing a recharge. 5 mile range at up to 15 miles per hour? All we need is either much better energy storage or some way of convincing people that pedaling when the juice runs out on your way to or from work, school, and shopping is a good thing.